Increases in the price and intensity (variety and complexity) of services. A growing and aging population only drove spending increases of 23.1 percent and 11.6 percent, respectively. These findings offer insight into why the U.S. spends so much on healthcare. Since price and intensity are the driving factors, the research suggests the need for more efforts to address those forces that control pricing. IHME’s research reinforces our interest in increasing price transparency and understanding whether more complex services produce better results for patients. 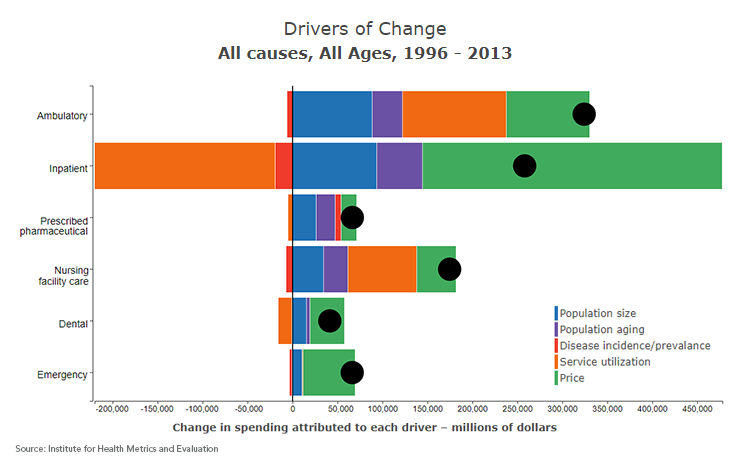 The article, “Factors Associated With Increases in US Health Care Spending, 1996–2013,” was produced as part of a grant awarded in March 2016 by the Peterson Center on Healthcare to the University of Washington to analyze drivers of healthcare spending and identify future trends to guide efforts to improve health outcomes and bend the cost curve. For the next phase of the work, IHME will compare the impact of these drivers on public and private payer spending as well as out-of-pocket costs. The institute will then forecast healthcare spending through 2040 and develop alternative scenarios to explore what changes among these drivers could have the greatest impact on slowing healthcare spending. The objective is for healthcare decision makers and stakeholders to use the historical analysis and future projections to guide investments that will improve outcomes and moderate the trajectory of healthcare spending. Understanding performance today sparks improvement tomorrow.